Leonardo, although he had made his name in the Medici court, where the work the family commissioned was intended to bring glory to their name, carried out his initial artistic experiences in Florence, where he stayed until 1482, in philosophical and symbolic terms, albeit neo-platonic, but already direct and not in complete conformity with the vague spiritualism which was the Court's philosophy. This is the main reason why he was not happy in the Medici circles and why he left Florence to go to Milan. On his return in 1500 the city was still Republican, but it would not be so for much longer (1512). The vague neo-platonic and evasive ideology has now been replaced by Machiavelli's harsh empirical conception of the modern state. Michelangelo and Raffaello have already created a different artistic atmosphere in Florence and, whilst Leonardo was artistically involved in Milan, Michelangelo (from 1504 onwards) moved the centre of art to Rome. The great new patrons of this period are Popes Clement VII, Julius II and Leo X. Raffaello came to Florence from Urbino in the same year as Michelangelo's departure for Rome. He stayed here for four years, long enough to leave a trace of his different conception of art as a means of justifying its own ends and as the fulfilment of the ideal form and technical perfection which, together with the complex and dramatic in heritance left by Michelangelo and the refined restless sensitivity of Leonardo, form the basis of Mannerism. 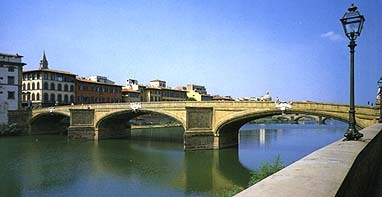 This style was already developing in the town, thanks to painters such as Bartolomeo della Porta and Andrea del Sarto, and later: Jacopo Carucci ("il Pontormo"), the most restless and problematic of all the artists working in Florence at that time, who considered art to be above all a "conceptual" expression; Rosso Fiorentino, in Florence since 1523, whose images are arranged in dynamic Michelangelo-type structrures, Agnolo Bronzino, who expresses himself in a very refined formal purity in the un-glazed perfect reproduction of his portraits, similar to cameos. 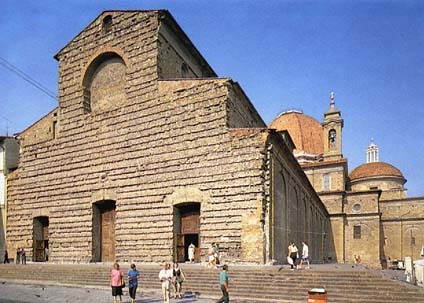 Michelangelo returned from Rome in 1516 to design the facade of San Lorenzo Church on request of Pope Leo X, a Medici. This appointment was later cancelled and converted into a project for the Church vestry for the tombs of Lorenzo and Giuliano dei Medici. In the main room and the hall of the Laurenziana Library, with its dominating central staircase giving the impression of a cascading wave of a waterfall, supported on the side by the balustrade and the thick line of high stairs, Michelangelo anticipates the characteristic of the Baroque style, which tends to force space inwards. Following the seige of Florence by the Spanish in 1529 and the fall of the Republic, in the meantime reestablished by Duke Alessandro dei Medici, Michelangelo was forced to leave Florence again. In 1534 he was re-called to Rome to undertake the Sistine Chapel frescoes. Meanwhile the aspect of the town of Florence, until then made up of streets and 15th and 16th Century palaces, with internal courtyards and gardens, now tends towards spacious piazzas, where meetings and theatrical representations are held. Giorgio Vasari, painter, architect, art historian, transforms the Palazzo degli Uffizi into a large urban hall. 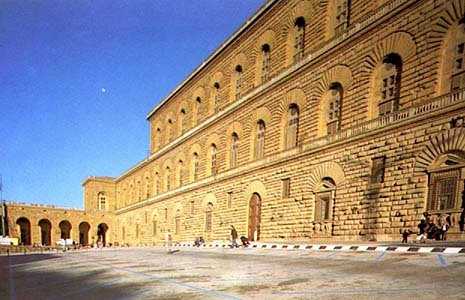 Bartolomeo Ammannati, sculptor and architect, transforms Palazzo Pitti into a long gable-surfaced structure. This building, together with the S. Trinita Bridge, gives us an example of the extreme blithe and refined elegance applied to a technical and rational object, also seen in the fountain in Piazza Signoria, jewel-like with its extremely elegant statues by Giambologna. Bernardo Buontalenti who succeeded Ammannati as architect to the Medici family, gives us the most lively example of the versatility of culture of that period. This extraordinarily versatile character, capable of reverting from urbanistic planning of the town of Livorno to designing jewels for the Grand Duchess, who organized firework demonstrations also prepared the plans for the Fortezza di Belvedere, as well as constructing palaces.